Have you got a few gene lists saved in BioGPS, and you’re ready to do more? If you want to perform gene enrichment analysis (e.g. GSEA, DAVID) or any other custom filtering, chances are you have a separate tool of choice. Now you can export your gene lists as a CSV file, easily the most commonly used file format around. 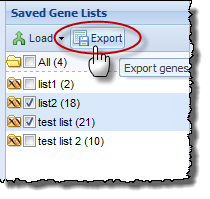 Select one or more of your gene lists and click the new “Export” button to download them. The output is a simple two-column comma-separated file where the first column is the gene ID and the second column is the name of the gene list each entry belongs to. We released the ability to save “gene lists” some time ago. It allows logged in users to save a list of genes from a BioGPS search result and load them back in at another time. To date, our users have saved over two thousand gene lists in BioGPS. To save a gene list, do a search in BioGPS, then look at the “Current Gene List” box on the left-hand side of the window. 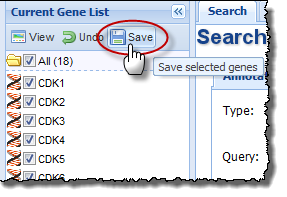 Check the boxes next to all of the genes you want to save from the “Current Gene List”, and then click the “Save” button in the toolbar. A window will pop up asking you to name your new list and optionally give it a description. Once you’ve saved a list, you can find it in the “Saved Gene Lists” panel at the bottom-left corner of the window. 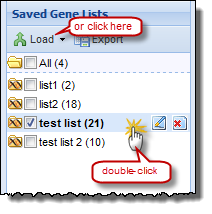 By either double-clicking the list name or selecting it and clicking the “Load” button, you will repopulate the upper “Current Gene List” panel with the contents of your saved list. Once your list is loaded, you can view gene-centric resources exactly as you would after searching for genes normally. This is feature #4 and the last in our weekly series New Year, New Features. We hope that you’ve enjoyed these posts and new goodies. Our efforts are still going strong, so even though this series is ending here, there is a lot more on the horizon. Sign up for the email, subscribe to our RSS feed or follow us on Twitter to get the latest. Thanks for reading!